Order in 22 Hours 44 minutes 18 seconds for dispatch tomorrow! Combo set includes 22oz fuel bottle and bigger stuff sac to fit fuel bottle. First ever dual-valve design offers an unrivaled range of flame control – simmer to boil with a twist of the flame adjuster. Three wide pot supports hold larger MSR pots or fry pans for gourmet cooking. Burns white gas, kerosene and unleaded auto fuel. Folds to 1/3 of its working size for easy storage. 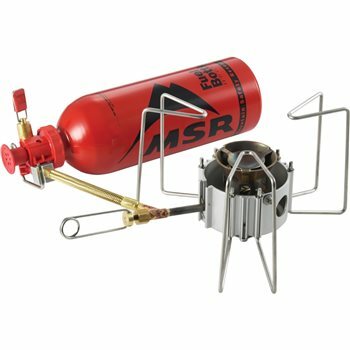 Pioneered by MSR, the separate fuel bottle and pump keep the flame away from the fuel, which allows the use of a windscreen to make the stove burn hotter and more efficiently. Clean out jet debris for high performance with a flick of the wrist. The suspended burner cup enables the stove to burn hot and strong while reducing heat lost to the ground.